How do I map accounts and tax rates to each Amazon income and expense type? What do I need to know about the Accounts and Taxes mapping feature? Accounts and Taxes is where you map Amazon transactions to account codes in your accounting software, so that the settlements arrive pre-coded every time. If using Xero, Tax Rates need to be set up in Xero. 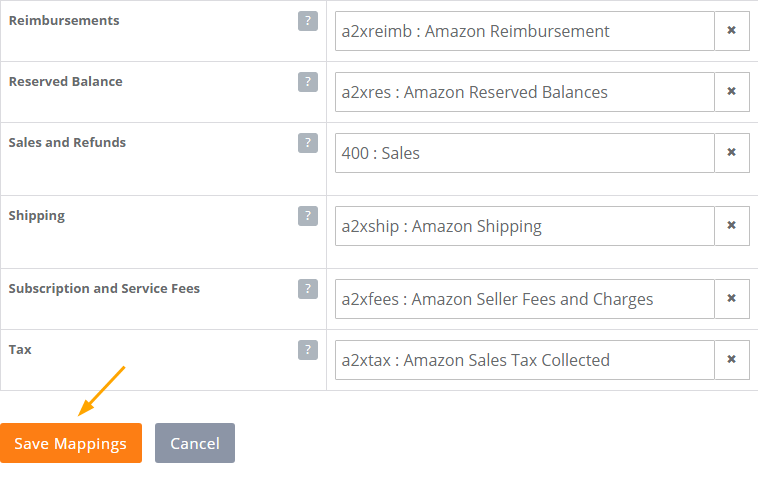 You can let A2X create a basic set of Amazon-specific accounts in your accounting software or you can create your own. This process is detailed in the article HERE. When A2X creates accounts in this way, it may find only one or two appropriate accounts in your Chart of Accounts (see '400: Sales' in screenshot below). A2X will assign letters to all other account types, and apply the best general accounting type. After saving your mappings, click on 'Enable AutoMapping', and check that your account codes have been applied automatically to your Settlements by reviewing one! This is often the case when you have custom specifications for reporting. Once you have created accounts in your accounting software, refresh your Cache in A2X. Instead of letting A2X create an account, click on the 'x' to the right of each account cell and then click on the drop-down arrow that will appear. You will see that you have access to all of your accounts in your accounting software and can choose each one appropriate for the transaction type. When you are happy with your mappings, make sure to click on 'Save mappings'! Lastly, click on 'Enable AutoMapping', and check that your account codes have been applied automatically to your Settlements by reviewing one! Well done, you've mapped your Account Types in A2X!